Abigail Reyes divides her life into two parts, “B.T.” and “A.T.” – before Terence and after Terence. In February 1999, Terence Unity Freitas, an environmental activist and her “partner in work and love,” was kidnapped and murdered in Colombia. At the time, he was working to halt the plans of major oil companies to drill in territory occupied by the U’wa, an indigenous group. “[Because of] that experience, which occurred when I was in my mid-20s and a few years out of college, I resolved to create a world in which that doesn’t happen,” Reyes says. A.T. – after Terence – she became a human rights and environmental lawyer, working primarily with communities struggling to protect themselves from unwanted mining, oil and gas projects. Reyes now serves as director of UC Irvine’s Sustainability Initiative, with the goal of harnessing the top research university’s scholarship and resources to develop new systems and cultures that no longer harm the planet – or people. “The initiative is making community-engaged sustainability scholarship an integral part of UC Irvine’s excellence as a research, teaching and service campus,” she says, “and we’re doing that so our faculty and students have the support they need to play bigger roles in addressing critical sustainability challenges here in Southern California and wherever their research takes them. Reyes, her husband (Sunil Gandhi, UCI assistant professor of neurobiology & behavior) and their two children were among the fortunate few who met Obama backstage before his speech. She used the opportunity to assure the president of UCI’s commitment to confronting global climate change. Reyes can already point to several efforts sparked by the Sustainability Initiative that put UCI on the front lines with communities grappling with climate change. She’s co-principal investigator and a team leader of the Flood-Resilient Infrastructure & Sustainable Environments – or Flood RISE – project, which educates and assists communities along the California coast and Tijuana River Estuary that are endangered by rising waters and stronger storms attributed to global warming. 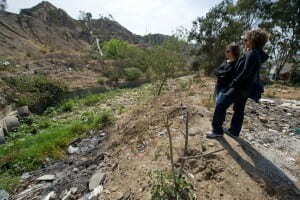 Abigail Reyes (left) talks to Sylvia Rico Medina and her son, Kevin, outside their Los Laureles Canyon home, which is threatened by rising flood waters. Empowering communities is a key focus of the Sustainability Initiative. And she helped create UCI’s interdisciplinary Salton Sea Initiative to address public health, land use, water allocation and other sustainability issues facing the desert region, with the goal of finding solutions that will benefit similarly situated communities worldwide. The Sustainability Initiative also mobilizes campus efforts in the areas of oceans, food, and environmental health and justice. This spring, Reyes’ office will partner with UCI faculty and students at the university’s Steele/Burnand Anza-Borrego Desert Research Center in Borrego Springs to advance the community’s long-range plan for achieving sustainability in an extreme environment. Some students will be chosen to share what they’ve learned with local public schools, teaching a younger generation about the climate crisis and how to foster community change. Reyes is working to incorporate sustainability in all academic disciplines. She and Tom Peterson, UC Merced’s provost & executive vice chancellor, co-chair the systemwide effort to make climate neutrality and sustainability part of the university experience for all UC students by 2020. (Read more about UC’s sustainability commitment at ucop.edu/sustainability). It can be overwhelming when students recognize how climate change is altering their own world, Reyes notes. Reyes (right) and UCI doctoral student Kristen Goodrich examine a severely eroded and flood-damaged canyon area in Tijuana, Mexico, as part of the FloodRISE project. It’s not enough to just make students aware of climate change, Reyes says. They need to learn how to take action. Her office has joined with UCI’s Academic Affairs, Student Affairs and Division of Undergraduate Education to support the Global Sustainability Resource Center, a hub for student leadership and sustainability education. Students who participate in the center’s education programs go beyond textbooks to the living lab – to homes threatened by rising seas, parched farmlands, vanishing glaciers and other climate-threatened sites in the real world. “In our programs, we allow students to have their own experience of what that loss looks like and how it affects them, and then we help them move from that state into imagining the world they want to create,” Reyes says. In January, the center held a weekend retreat at the Anza-Borrego facility for about 30 students enrolled in the global sustainability minor to teach them how to become leaders in climate change efforts – and stay ahead of the curve, as Obama exhorted them to at commencement. The training was one in a series recognized by the White House at the recent launch of a new national Climate Education & Literacy Initiative.